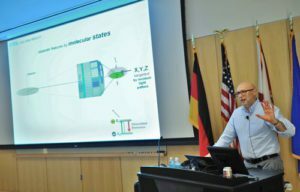 This 1-day workshop will kick off with an introductory lecture by Stefan W. Hell, the inventor of STED microscopy and 2014 Nobel Laureate in Chemistry. Following a casual lunch with time for in-depth discussions, seasoned super-resolution experts will present talks on fluorescent labeling and sample preparation, cutting-edge technology and recent applications of STED in neuroscience. Live demonstrations of the STED microscopes will round off the experience. A limited number of hands-on sessions are available for bringing and imaging your own samples on a STED microscope together with an expert – sign up quickly, as spaces are highly limited! Open to faculty, staff, students, and post-doctoral researchers of all experience levels who are interested in utilizing STED in their field of research. STED microscopy enables to resolve structural details in a variety of fixed and living samples, enabling to address novel biological questions. The preparation of samples for STED microscopy is very similar to conventional fluorescence microscopy. However, the increased resolution, requires additional precautions to ensure structural preservation of the specimen, sufficient labeling density and right choice of dyes. In this talk cell biological applications being addressed with STED microscopy will be described. Further strategies for preparation of fixed and living samples for STED microscopy will be discussed. 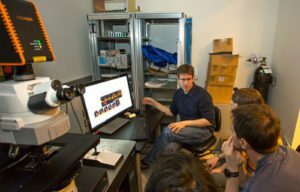 Super-resolution imaging techniques have been steadily advancing as useful tools in the field of neuroscience. 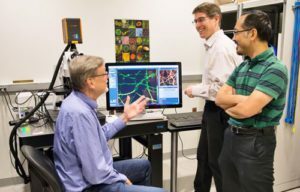 STED microscopy in particular is highly adept at imaging functional neuronal systems on the synaptic level, which often requires a combination of high spatial resolution and fast imaging speeds within dense neuronal tissue. This talk will highlight some of the recent applications of STED in the field neuroscience, from synaptic morphology in tissue slices over in-vivo imaging of synaptic proteins to quantitative Ca2+ imaging at the synaptic active zone. More than two decades of research experience in super-resolution microscopy and a passion for developing novel concepts for this new era of microscopy enables the team of Abberior Instruments to offer novel super-resolution microscopes for the use in life sciences. In this talk the two Abberior Instruments STED microscope platforms available in the workshop, their use and applications will be described. Further basic concepts and recent developments in STED microscopy as miniaturization, easy3D STED and reduction of the light intensities in RESCue STED will be discussed.